Most homeowners know that they need to purchase homeowner’s insurance to protect their home and personal possessions in the event of a fire, storm or break in. Many renters may be unaware that they have the option to purchase similar insurance. This insurance is known as renter’s insurance. Learn the process for getting this insurance and what it typically covers. Are Renters Covered by Landlord’s Insurance? Dwelling- The insurance policy will cover the physical building in the event of a fire, windstorm, hail storm or other natural disaster. Other Structures- Other structures on the property may also be included under the insurance policy, including a shed, detached garage or fence. Personal Property- The landlord’s insurance policy covers the landlord’s personal possessions at the rental property. This could include an office that a landlord set up at the rental property or tools that a landlord keeps in a basement workshop. Since tenants move in and tenants move out all the time and there is no way of knowing the actual possessions that each tenant owns, it would be impractical for a tenant’s personal property to be insured under a landlord’s personal insurance. The tenant’s possessions belong to the tenant, not to the landlord. Therefore, if a tenant has an interest in protecting their personal possessions, he or she needs to purchase their own personal renter’s insurance policy. Personal Possessions- The insurance policy will cover the value of the tenant’s possessions. The greater the coverage amount, the more expensive the policy usually is. 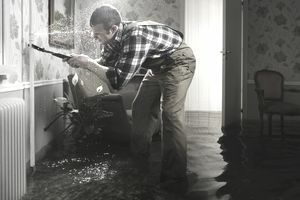 Liability- The renter’s insurance policy can also provide liability protection for the tenant. If a guest of the tenant is injured by one of the tenant’s possessions or the tenant causes damage to the guest’s personal property, this liability coverage can help cover medical bills, court costs or costs to repair damage. Loss of Use- If you are unable to return to your rental property due to a fire or other natural disaster, many renter’s insurance plans will pay for you to stay in a hotel or other temporary housing. According to Insurance.com, the average cost of a renter’s insurance policy with $40,000 of personal property coverage, a $1,000 deductible and $100,000 of liability coverage is $17 a month of $197 a year. Coverage Amount- The higher the personal property coverage amount, the higher your premium. You will obviously pay more for a plan with $100,000 of personal property coverage, than one with only $12,000 of personal property coverage. Your Deductible- The higher your deductible, the lower your monthly payment. In the event that you have to file a claim, you will first be responsible for meeting your deductible. If your deductible is $1,000, you will have to pay $1,000 out of pocket before your insurance kicks in. If your deductible is only $150, you will only have to pay $150 before insurance will kick in, but you will most likely pay a higher monthly premium to make up for the added risk to the insurance company of such a low deductible. The Type of Coverage You Want- There are two main types of coverage options, actual cash value coverage and replacement cost value coverage. Actual Cash Value- Actual value is usually cheaper than replacement value because it accounts for what the item would be worth when you file your claim, not the original cost when you purchased it. For example, a television may have cost $1,000 when you originally bought it, but it is now 5 years old, so depreciation has to be taken into account, so you may only be given $300 to replace the television with actual value coverage. Replacement Cost- With replacement cost coverage, you will be compensated for an item of a comparable value, quality and function. Policies based on replacement cost are more expensive, but they compensate you more closely for the original price you paid for the item. The Area You Live In- If you live in an area with high crime, you will have to pay a higher premium. This is because there is a greater risk that you will be a victim of theft or burglary. The insurance company has to account for this increased risk when it offers its policies. Credit Score- The higher your credit score, the less you will pay, the lower your credit score, the more you will pay. Again, if you have a higher credit score you are seen as less risky to the insurance company. If you have a lower credit score, you are a riskier client for the insurance company. Smoking Status- Non-smokers may receive better rates than smokers. Smokers have the increased liability of setting a fire. Pets- If you own a dog breed that is considered dangerous, such as a Pit Bull, you will likely pay higher rates for your renter’s insurance because these animals pose an increased risk for the insurance company. Some insurance companies may even refuse to insure renters with these dangerous breeds. Safety Measures- If you live in an apartment with a sprinkler system, smoke detector, carbon monoxide detector or deadbolt on the door, it could help reduce your premium. To get the best rate for renter’s insurance, you need to shop around at several different insurance companies. Contact Current Insurance Carrier- Contact your auto insurer. They may offer special discounts for having more than one insurance policy with them. Membership Discounts- You should also check with any groups you are a member of to see if they offer any insurance discounts. This could include The American Automobile Association, AAA, colleges and universities and even the big box clubs, like Costco. Your landlord may even have an arrangement with an insurance company and might be able to get you a better rate. Is Renter’s Insurance Worth It? You may believe that your possessions are not valuable enough to justify the expense of renter’s insurance. Think again. You might be surprised at how valuable your possessions actually are once they are all added together. On average, you can get a renter’s insurance policy for $10 to $20 a month, which would be between $120 and $240 for the year. The cost to replace a computer or television alone is much higher than that. There are many calculators available online, including this one on Geico, that can help you get a rough estimate of the value of your possessions. This can help you understand how much coverage you will need in your renter’s insurance policy. You might think the chances of a fire or storm destroying your property are slim, but renter’s insurance also covers theft and burglary. It is estimated that a burglary occurs every 15 seconds in the United States and most occur between the hours of 10 A.M. and 3 P.M.
Five of the most commonly stolen items are cash, smartphones and laptops, other electronics, gold and jewelry. If you are a victim of burglary, your renter’s insurance policy can provide you with the money to help you replace the stolen items. How Much Will You Have to Pay If You Break a Lease? Can a Landlord Get Rid of a Tenant’s Abandoned Property? Should You Let Tenants Pay Rent With Venmo?